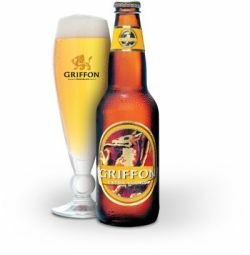 As gold medalist in the Golden Canadian Ale category at the 1996 World Beer Cup, Griffon Extra Pale Ale has earned a place of honor among Canadian premium beers. Noted beer expert and author Charlie Papazian praised Griffon Extra Pale for its bright gold color, clean hop and malt flavor and "great drinkability". Draft at the st ambroise brewery in Montreal. The body is yellow with a small white head. The aroma has sweet malts. The taste is sweet and reminds me of corn. Bright golden color with moderate pearly activity. Foamy 1 finger head, lasting around 5 minutes, with poor legs. Flavors of sweet grains, corn syrup, green jolly rancher, lemon, mint, herbal spices. Very sugary, unbalanced and excessive, with sharp fruity citrus feel. Slick and smooth medium to full body with prickly carbonation. Strong finish, thick leafy hops with lingering caramel, grassy and slightly earthy, with dry sour lemon. Very sharp sourness on the tongue at first, you get used to it, although I’m finding it too coarse like a fishermans friend. Highly alcoholic, feels like malt liquor and it’s quite metallic. A hint of adjunct coupled with mediocre freshness. The taste is below average quality. Overall mediocre quality craft. 341 bottle. Clear golden color. Medium head. Delicate taste. Some bitterness. Good, not great. At Au Pied De Cochon. Blond color, foamy head and a grainy fruity aroma. The taste is tangy lemon and crackery wheat/malts. It seems a little acidic but isn’t that bad. Definitely a pretty boring beer that doesn’t live up to the intense flavors you expect at Au Pied du Cochon but firmly in line with McAuslan’s middle of the road brews. On tap at the brewery terrace as part of a 12$ tasting set.Griffon blonde is a crystal clears old with an rough earthy light grainy aroma.smooth satisfying body the taste is a bit coarse, sweet caramel a bit buttery - possibly diacetyl. Grainy sweet mild caramel is how I would sum it up. Average to sub-par. Rating datant du 11 juillet 2015. Bière blonde en bouteille de 341ml, formant un beau collet de mousse. Caractère malté assez présent avec peu d’arrière-goût. Bottle. Golden color, normal white foam. Aroma: malt, slightly floral tones. Malty taste, slightly fruity. Vom Fass im Restaurant in Montreal. Goldgelbes Bier mit schönem weissem Schaum. Getreide und Hopfennoten. Süffiger Geschmack.